With the HubSpot Sales Chrome extension for Gmail, HubSpot Sales Office 365 add-in, or the HubSpot Sales Outlook desktop add-in, you can access your sales tools directly from your inbox. Refer to the table below to determine which extension or add-in is compatible with your setup. *Some sales tools cannot be used without a connected inbox. Please note: HubSpot Sales does not support Apple Mail. Apple does not provide support for third-party developers creating Apple Mail add-ons. Click here to navigate to the HubSpot Sales extension in the Google Chrome store. In the dialog box, click Add to Chrome. If this is the first time you've added the extension, you'll be prompted to log in. Log into your HubSpot Sales account when prompted. With the HubSpot Sales Chrome extension, you'll have access to your templates, documents, and sequences from your Gmail inbox. You'll also receive instant Chrome notifications for tracked emails and can quickly see your activity feed by clicking the extension icon in your browser toolbar. If you are a Google admin for your organization, you can automatically install the extension for multiple users. The HubSpot Sales Office 365 add-in requires an Office 365 account (Office 365 Business Premium, Office 365 Business Essentials, or Office 365 Personal). If you don't have an Office 365 account but use Outlook for Desktop on Windows, install the HubSpot Sales Outlook desktop add-in instead. 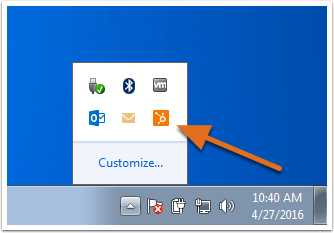 Do not install both the HubSpot Sales Office 365 add-in and the HubSpot Sales Outlook desktop add-in on the same device. These add-ins will conflict. Outlook installed from the Microsoft Store is not compatible with the HubSpot Sales Office 365 add-in. Check your Outlook version to ensure it is Click-to-run. Click here to navigate to the add-in in Microsoft AppSource. In the left sidebar, click Get It Now. In the dialog box, click Continue. You'll be taken to your Office 365 account. Click Add. Once installation is complete, you'll be redirected to a page indicating the add-in has been successfully installed. You can now access your templates, documents, and sequences from your Outlook inbox. To receive instant notifications for tracked emails, run Chrome with the HubSpot Sales Chrome extension installed. Office 365 admins can centrally deploy the add-in to all Office 365 users in your organization. When the add-in is centrally deployed, all Office 365 users on the domain will automatically get the add-in, with no additional steps required. Follow Microsoft's instructions to publish Office add-ins using centralized deployment via the Office 365 admin center. On the Centralized deployment step, select I want to add an Add-In from the Office Store, and search for HubSpot Sales. The HubSpot Sales Outlook desktop add-in does not support Outlook for Mac. 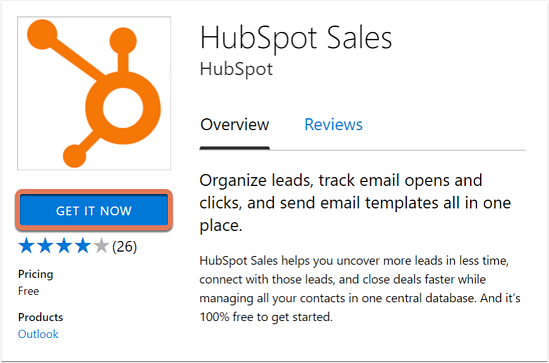 If you use Outlook for Mac, an Outlook on the web account, or an Outlook.com account, install the HubSpot Sales Office 365 add-in instead. Additionally, HubSpot Sales is not supported in terminal server environments. Do not install both the HubSpot Sales Office 365 add-in and the HubSpot Sales Outlook desktop add-in on the same device. These add-ins will conflict and cause issues for your sales tools. Outlook installed from the Microsoft Store is not compatible with the HubSpot Sales Outlook desktop add-in. Check your Outlook version to ensure it is Click-to-run. Click here to download the HubSpot Sales Outlook desktop add-in. Run the HubSpot Sales for Outlook installer (setup.exe). If you come across any errors when installing the extension, refer to the installation troubleshooting guide for more information. When prompted, log in with your HubSpot Sales account credentials. Once installed, HubSpot Sales should appear in the inbox ribbon. You can now access your templates, documents, and sequences right from your Outlook inbox. To receive instant notifications for tracked emails, run Chrome with the HubSpot Sales Chrome extension installed or download the HubSpot Sales for Windows tray app. This is an additional component of the add-in that allows you to receive instant notifications without running Google Chrome. Click here to download the HubSpot Sales for Windows tray app. Run the downloaded setup.exe file. Once the app is installed, you can view your activity feed by clicking the HubSpot sprocket iconsprocket in your Windows tray.